Desktop emailing literally started with Outlook Express for the very first time. The client was a default program with the previous versions of Windows including Win XP. However, it was officially discontinued by Microsoft Corporation after a period. Nevertheless the data cannot be compromised with therefore users maintain the archives still. The freeware of Outlook Express DBX Locator enables users to locate and list available DBX files. As part of the demo limitation, the files cannot be saved to the machine. Outlook Express is an email client that is only meant for basic communication purposes. The application promoted emailing services and only stored contacts and emails for the configured account. The files generated are of .dbx format and are the default repositories for email contents of plain text format. The specialty of Outlook Express is that it generates a DBX file for each email folder. Therefore, the collection of a number of DBX files is usual. Manually locating and copying these files and relocating them to a common place, takes up user efforts and time as well. Therefore, the best way to do so is by using a third party application for the same. The role of Outlook Express DBX Locator is to automatically find the location of all DBX files available on the machine and list them. Users can sort and select the ones they need to save by using checkboxes provided against each file. The files are listed with attributes that show the time they were last used along with the path on machine. Once saved, these DBX files can be managed singlehandedly by the users. Is it possible to find the DBX files generated by Outlook Express? 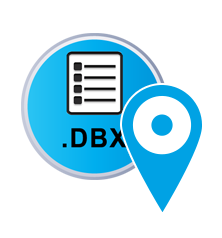 DBX file locator is a capable solution to find the email repositories with .dbx extension and list them for users. Will I be able to relocate the files found by the tool? Yes, you can use the Save option to relocate the DBX files found by the tool, to a location of your choice. What provisions are provided for the end user’s convenience? The software features checkboxes against each DBX file found. All or selective DBX files can be saved with the help these checkboxes.